A Cameroonian young entrepreneur William Elong, founder of Will & Brothers start-up, has officially presented the first drones manufactured in the central African nation on February 2, 2018, in Yaoundé. The three flagship products are Algo, a fixed-wing UAV, which has a range of 20 km and autonomy of more than 45 minutes; Logarithm, a rotary wing drone; and Sanaga, a ground drone named after the largest river in Cameroon. Bachelor at fifteen, William Elong is the youngest graduate in Strategy and Economic Intelligence of the School of Economic War of Paris. His initiative DroneAfrica aims to offer services associated with drones in tourism, agriculture, meteorology, defense and cartography. It promotes local tourism, low-cost tracking for mining projects and urban development; more effective coverage of major events such as fairs, cultural events or football tournaments; the collection of images in disaster-stricken areas, etc. The prices of his drones are “25 times cheaper” than the market price, he said. However, the genius did not disclose the prices to the participants of the B2B meetings held after the official presentation. 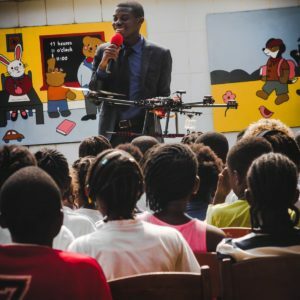 Following a first successful fundraising of $200,000 to set up an assembly workshop in Cameroon, the startup has launched a second campaign this month to increase its production and conquer the international market. Posted by Emmanuel Agbenonwossi on February 9, 2018. Filed under News. You can follow any responses to this entry through the RSS 2.0. You can skip to the end and leave a response. Pinging is currently not allowed.